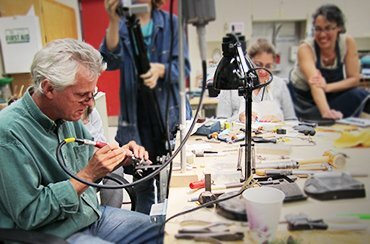 With over 30 years of experience handcrafting custom jewelry, Jim Dailing brings an unsurpassed level of knowledge, enthusiasm and skill to his workshops. Jim has traveled all over the country sharing his passion for creating unique rings and necklaces. Class sizes are kept small in order to provide personal attention to each student. Please contact Jim if you are interested in joining the next workshop or scheduling group instruction for your school.